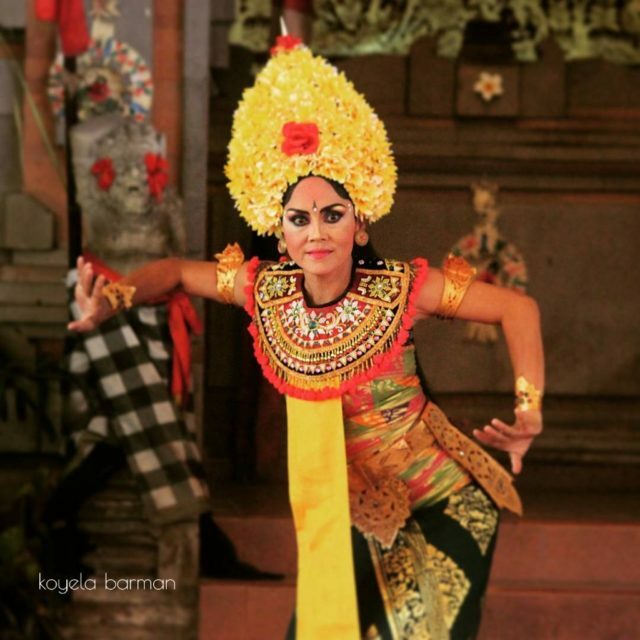 A Balinese Sojourn - Ghumakkar - Inspiring travel experiences. Travelling has always been my favourite hobby; the thirst to know the unknown and see the unseen has always gratified me. Travelling to Bali was one of such unique experiences. Gearing up for the trip was in itself a very happy experience for us. My Husband (who is an avid traveller and an amateur photographer) and I had been planning to visit this paradise island for a long time. After boarding the flight from the Kolkata airport, we landed in Kuala Lumpur and had a two hours layover. At about one passed ten our flight touched the ground. As we disembarked a guide came to collect us. He was wearing a traditional Balinese attire and that was a good thing to see. We greeted each other and hopped into their car. The chauffeur was also a nice guy; he waved at us sweetly. We checked in at the Holiday Inn Express hotel in Kuta. Evening was closing in and we had to rush to our first destination, the Batubulan village which is in Ubud. 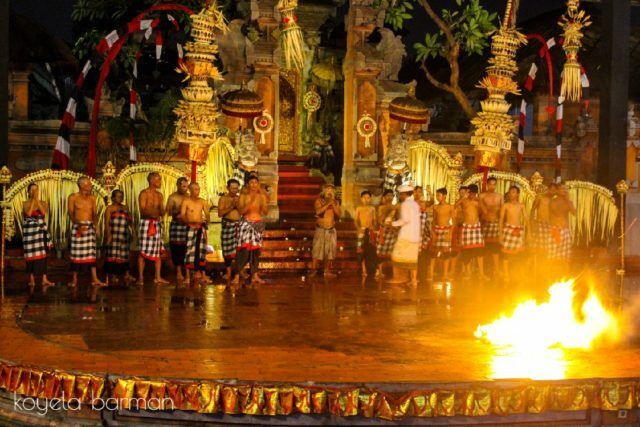 Every evening the villagers there enthrall the tourists as they enact the stories of Ramayana, in a dance form, popularly known as the Kecak fire dance. By the time we reached there it was already dark; we sat under a big thatched shelter and the stage was right in front of us. As the villagers started to dance I could hear the rumbling of the clouds. Our shelter was open on all sides and in no time rain began to lash down. The intensity of the shower was so heavy that it made my heart pound. Experiencing rainfall on an island is so different and awe inspiring. It was indeed a very thrilling experience on the inside as well as on the outside. That night we were escorted back to the hotel and we hit the sack right away. The next morning was too exciting as there were a lot of plans ahead of us. I woke up and scurried down to have my breakfast. It was a huge spread and I dug in ravenously. By 8 a.m. we were in Ubud ones again. We were about to witness two more dance dramas — The Barong and Keris dance respectively. I personally liked the Barong dance, the intricately designed costume and jewelleries worn by the danseuse stole my heart away. I got a chance to take some pictures with them but had to hurry to my next destination. Later on, the same day we visited the Tegalalang rice terrace (Ubud). Paddy being their staple one can come across many rice fields while travelling in and around Ubud. 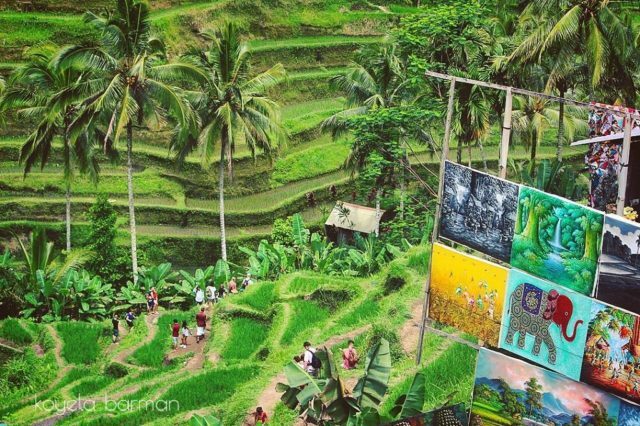 But some are very popular with the tourist — Tegalalang is one such rice terrace. The greenness of the place mesmerised me and the step farming added to its charm. One thing to add here, when in Bali don’t miss out on coconut water. The coconuts are huge and I bet you will get tired drinking the endless sweet water inside. 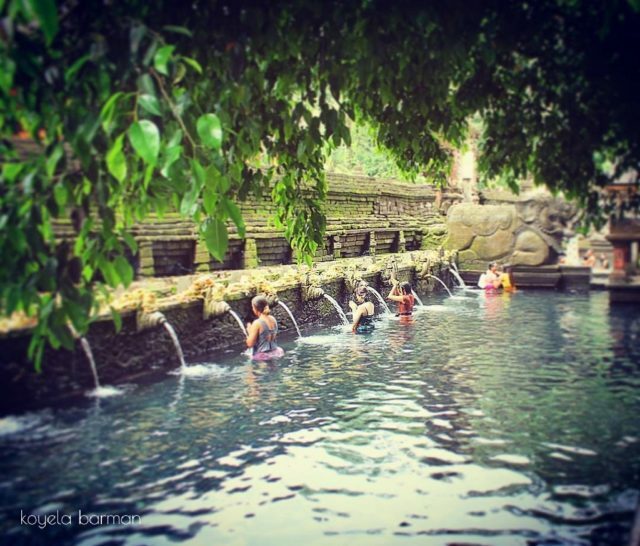 Our next destination was to the Tirta Empul (sacred water temple). The tourists here have to wear a sarong round their waist; so we too donned them on. Many locals and visitors were seen going down into hip deep water and cleansing their minds and bodies with the holy water that gurgled out from the opening above their heads. I felt so pious and watched them do the rituals. From there we headed to Kintamani; on the way our guide ‘Banquo’ updated us about the upcoming places while we listened to him intently. In no time we had reached Kintamani and halted in front of Mount Batur. This volcanic mountain has been dormant for decades but if looked minutely ashes and cinders can be noticed around its opening. The Batur lake is close by and it is a wonderful place to be. I alighted from the car and was taken to an adjoining hilltop, from where we got a clear view of the volcanic mountain. The hill houses an open air plush restaurant and we had the opportunity to have a sumptuous Balinese lunch there. They serve finger licking Nasi Goreng platter there. The Ubud central market isn’t far from there, so we paid a short visit there as well. The Ubud village is a must visit, it houses a place named Celuk which is famous for its gold and silver jewelleries. But I would suggest to hone up your haggling skills before you venture out to buy jewels from there. The Mas village is also worth visiting as it boasts of beautiful handicrafts and wood carvings. Time was running out but we had so much left to see. 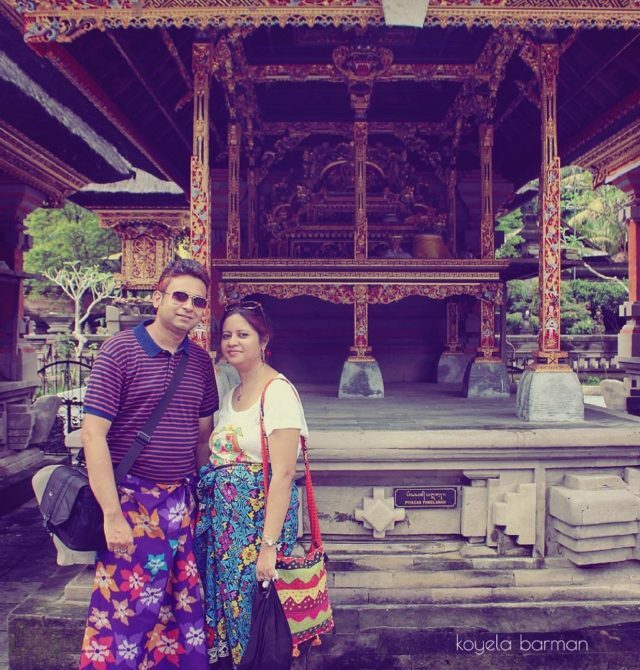 It was time to go the Besakih Temple in Karangasem, East Bali. It is the mother of all the temples in Bali with Mount Agung in the backdrop. As our car was nearing the temple I could feel the aura of the place. Soon the marvellous temple came into sight. The magnanimity and vastness of its being captivated me. A flight of stairs took us up to the inside of the temple. Here, clicking is prohibited as it is considered a very sacred place by the locals. So, we rambled about every nook and corner of the temple and also enjoyed a lovely view of Mount Agung from there. Last year this volcanic mounted erupted. But there was hardly any harm to the people and the livestock as the government managed to evacuate the place on time. Many tourist, however, were stranded because of the cancellation of flights. Still, this place remains a top tourist attraction. On our return we covered the Bukit Jambul rice terrace which is almost at par with Tegalalang. Some quick shots and that’s it. Evening was closing in and I wanted to return. Our enthusiastic guide was still brimming with energy and requested me to visit the Dutch palace, popularly known as Klungkung Palace. As it was on the way to the hotel, I complied. The next morning, I woke up to the warble of the birds. Within half an hour we were speeding past the houses, temples and coconut groves. 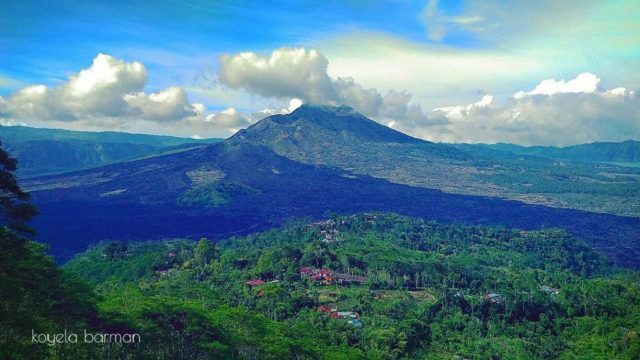 The place where we were going is called Bedugul, it is located at a higher altitude so a bit cooler than the rest of the island. Our car drove past the mountain road while we did not miss a single chance of capturing the picturesque view that we got of the valleys below. Soon we arrived at the Taman Ayun Royal Temple. It is a cluster of temples situated amidst profound greenery. The visitors are allowed to ramble about the premises and click pictures. But entering the temple is prohibited. The locals impeccably dressed in their regular attire were seen busy with the daily rituals. 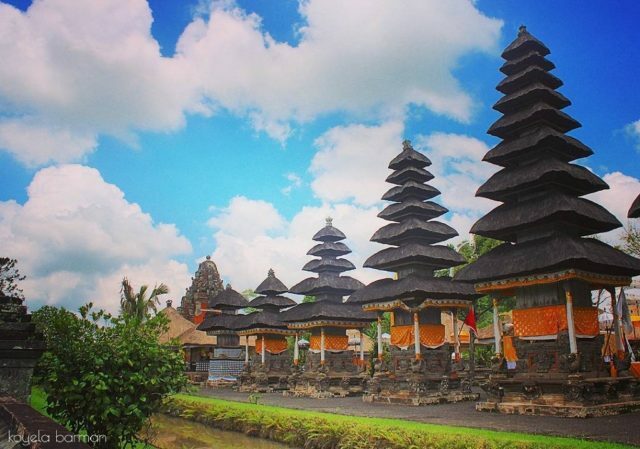 The temples are shaped like pagodas and carries the essence of the Balinese culture and style. On our way back, we drove past the strawberry fields and also halted to taste the world famous Luwak coffee. 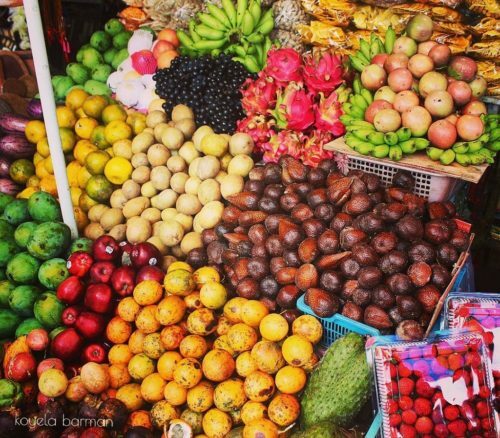 Candi Kuning is a traditional fruit market which is located near by and is a must visit. Later on, in the day we visited the iconic Ulun Danu Temple. It is a similarly an important place to visit with the sprawling greens overlooking the mountains. The temple itself stands tall on the lake. 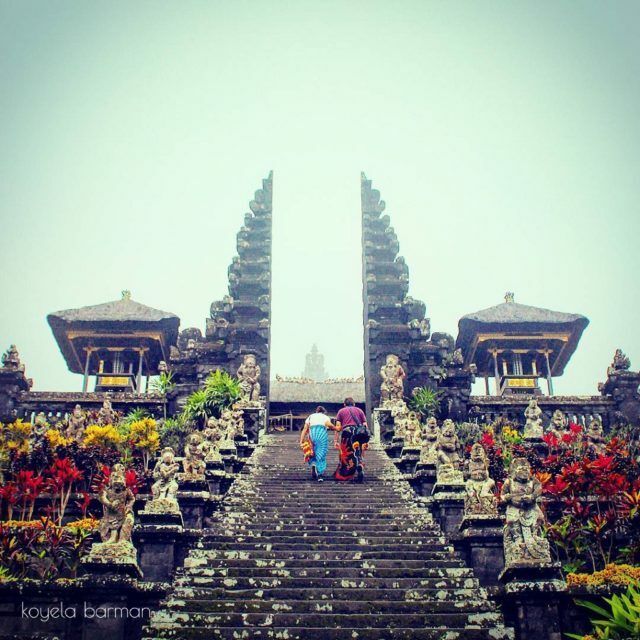 Multitude of people gather there to have a glimpse of it as it is considered the most iconic temple of Bali. Soon after we headed to the Tanah Lot temple in Tabanan. It is the best place to witness the famous Balinese sunset. Though the temple is located on the shore the water overflows from its staircase when it is a high tide. Tourists generally have to wade through the water to reach the temple. The area is surrounded by cliffs and one can get a wonderful view of the sunset from the top. Finally, the last day began with a nice Balinese spa. It was so rejuvenating, one must not miss it at any cost. We went beach hopping that day. 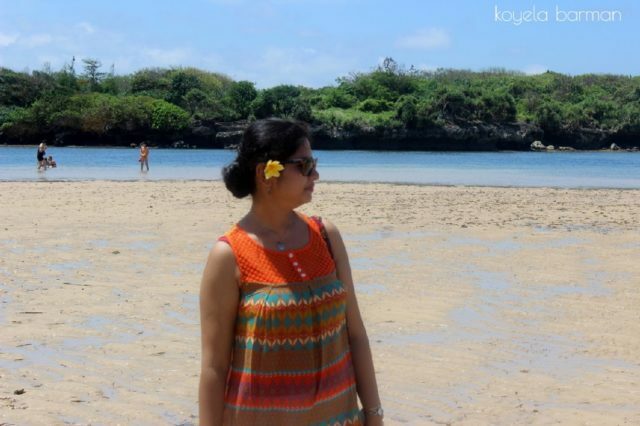 First, we went to the Benoa beach, it is famous for beach activities. As I am not very much into water sports, I just took some vibrant pictures and headed to Nusa Dua. Now that is the place one would hanker for. The turquoise calm water of the sea and the vast white sand beaches will make one go weak in the knees. There are small cluster of islands scattered here and there and in one such island we almost bumped into two monster lizards; it was fearful but exciting. On our way back, we were dropped at the Padang Padang beach; this particular beach is a big hit with the Australian tourists. Moreover, the movie ‘Eat Pray Love’’ has been shot here. Sunbathers gather here to soak in the tropical rays of the sun. The beach is dotted with limestone rock formations; these structures add to its beauty. The water is pristine and blue and an aerial view of the beach is a photographer’s delight. However while descending to the beach one has to take a flight of narrow rocky steps. 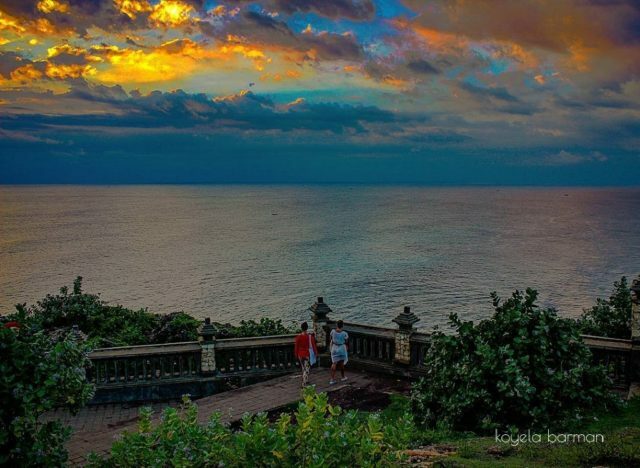 From there we were taken to the Uluwatu Temple; it is one of the most sacred temples in Bali perched on a cliff top. 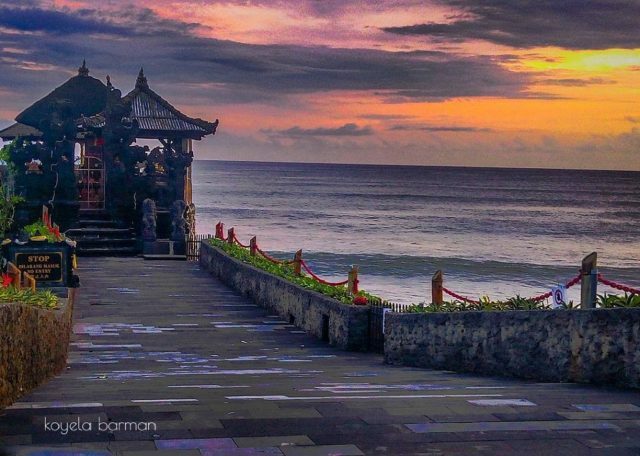 Here the Balinese sunset can be seen in its full glory. Thousands of people including devotees and tourists throng the place. One can saunter along to reach the sunset point. This place is infested with mischievous monkeys, so it is wise to keep all the belongings in the bag. Finally, at sunset we arrived at the Jimbaran Bay for a romantic dinner on the beach. This beach has something very special to offer. As the sun goes down tourist crowd the place to dig into the sumptuous dinner they serve at the beach. One must try out the sea food here. We had a flight to catch the next day but wanted to make the most of it before we leave. So, we went for beach hopping again for some sunshine vitamin! 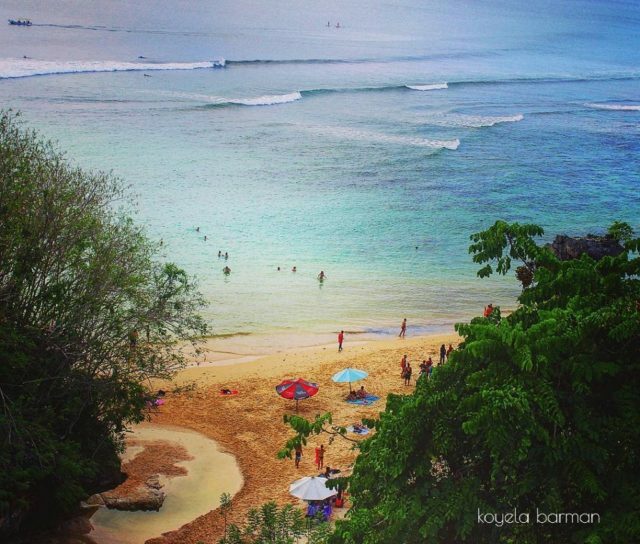 This time we took a stroll along Bali’s most popular beaches — Kuta, Legian and Seminyak. All the three beaches are picturesque and touristy. 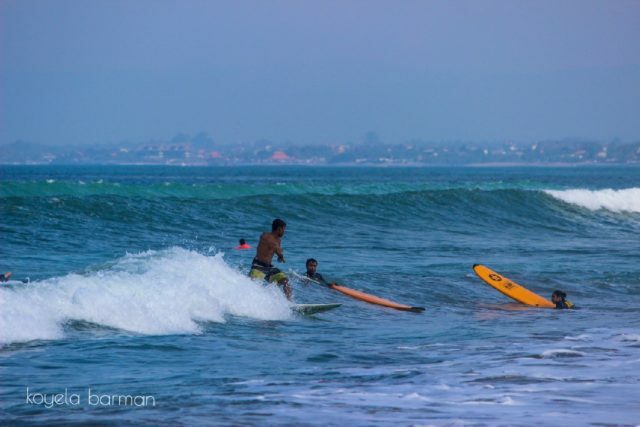 The Kuta beach, in particular, is a wave surfers’ paradise and it is a wonderful spectacle to see the surfers dashing in and out of the waves. It was time for us to wind up; with a heavy heart we headed off to the airport. Our flight was in the evening. From the window I could see the sun setting behind the horizon. I felt a little morose but the prospect of returning home made me feel relaxed. It was altogether a wonderful journey that I shall cherish for a long time. Known the world over for its natural beauty and culture Bali is an amazing place to visit. Glad you decided to share it with us. Stunning landscapes and temples, pictures of which look rather like paintings by a master. Thanks a ton for liking my story! Col NN Bhatia, Author at Ghumakkar – Inspiring travel experiences. Thank you so much for appreciating my work. I would love to read your articles too! Never Been to Bali , but your Narrative is so exciting that I already wish to plan a visit ! Thank you for such a nice narrative ! Hi! Great write-up indeed! I enjoyed reading it aloud to my children. A visit to Bali is top on my wish list. Loved your skill at photography too…My wanderlust has most certainly been reignited. Thanks for sharing your experience! Looks like you and your husband had a great trip at Bali. The rains, the temples, sunset, greenery everything looks just too tempting to plan a trip to Bali, soon! Great pictures and well written post. Enjoyed reading it! Thank you Archana for liking my story! It was pleasing to read your blog and recall all the beautiful memories I made during my trip to Bali. It is a very beautiful place to plan a family vacation. Your pictures and the write up says a lot about the experience you would have had. Thank you Muskan,it was indeed a wonderful trip. Would also like to know about your experience in Bali. Very much informative aboit the particular place. Nicely composed well done Koyela why dont u pu lished in a small book form. Keep it up Koyela. Travelogue very well written. Was the Bali trip through a travel agency or on your own. Would appreciate details. Thank you for liking my story. Although a travel agency organised our trip, it was a customised trip as we opted out some places and added a few in . MADRID — Bienvenido a España !! Hailing from southern Spain’s outcast populations, flamenco dance and music drew early influences from Greek and Roman and later from Indian, Moorish, and Jewish cultures. With the arrival of the Moorish and Jewish populations to the Iberian peninsula centuries ago, Andalusia’s already thriving music and dance inadvertently began extracting characteristics from the newly-arrived populations. The flamenco dance and music that we see today are the dazzling results of centuries of absorbing and flawlessly sewing together elements of this myriad of diverse cultures.